Dear Sir, Herewith please my thanks to Epic research and Ms Juhi client support executive for the timely and useful support extended in Premium Cash Quarterly services. Ms Juhi is doing excellent job in supporting the day to day trading activities . Her excellent support inspired me to take the Quarterly Premium cash service and i will surely extend the same once my subscription will be over. I am once thankful to the team and Ms Juhi in particular. Dear Varsha & Saurav,First of all I would like to say thanks to both of you for the support that given to us.By your reccommendations and support i am gaining something from my trading.I am understanding that every days trades will not be fruitful.But only by your support and guidance as well as confidence in your reccommendation,i am on the way to my goal.Hence hopping a long term relationship and the fulfillment of your commitment,i am gratituting both of you on behalf of me and Prajith. Hello sir, My name is rajendra goyal, belongs from Indore. I am one of the member of your firm. I am trding in equity cash and future. I am verry thankful to your executive ANJALI CHOUHAN For best intra day call and support regarding target and stopploss. Hi this is deendayal, Its a great experience working with Badri Dangi sir, his communication skill and great client-employee relationship. I am so great full to having a supporter of Omkar and Parminder. I really appreciate your Effort and I like the paten of your work. Both of you are so dedicated and supporty. I am very happy to work epic research. 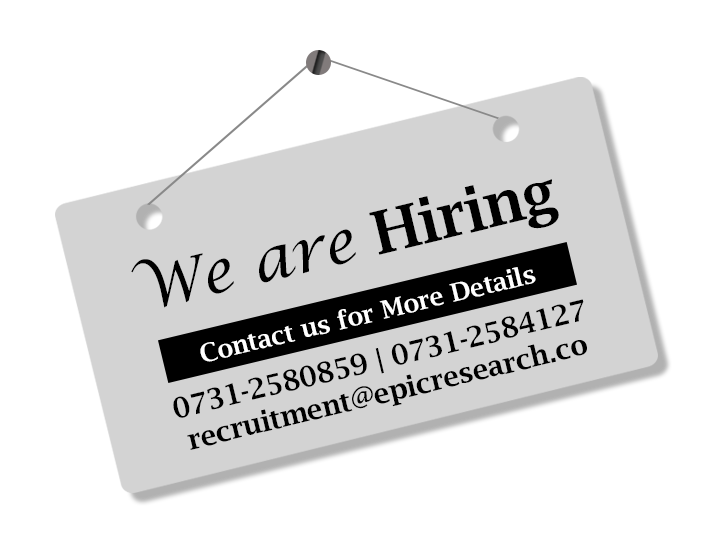 I am working with epic research since last two yrs nearly , my Executive on behalf of epic Mr. Onkar Singh and MR. Sajjad are very supportive . They prompt to solve any query related trading or any other issue raised by me. I am very thankful to both of them for best support to me. I pray for their bright future in Epic research. I Chandan Das, I m satisfied the service of epic research's trading call. My executive Mr. Vinay everyday call me. M very happy to give your service. IT Simhachalam having premium options in epic research has been started trading services since couple of days. I am very much happy with epic research ltd team i.e Miss Manisha & Mr. Abhishek who is always in touch with me during the trading and given full support with patience. I request to both of them to give full support in the coming days. Actually I lost Rs.5,00,000/- in two months and I felt very bad, in the time Miss Manisha approached me I told her my complete details regarding loss of money in the trading and according she assured me dont worry we will give full support and give learning classes, accordingly they given full support and now I am happy with trading. I request them to give full support in the coming days. Thanks Epic team, specially Ahmed sir, Vinay Sir, Nehaji., for issuing opportunity to work with you in Swing Cash. I have so many calls in last 15 days from different companies, buy I choose Epic. It's very early to say, but I think I am right. Because the pattern of your work is very nice, selection of levels are really mind blowing. Ahmed Sir's communication with clients is amazing. Beyond this, you always think client satisfaction. Day will come when 'Epic Research' touch the sky in corporate world. My best wishes will always with you. Sir I have a logo for you, 'Demand our lives, not the levels'. I would like to thank you. I'm just writing to express my appreciation regards your employee Dipanjali . * It has been a pleasure working you and your staff on both of these trading call activities. Your staff has been very accommodating, helpful and very friendly.she is following very sincere for entry and exit.some times she is calling after trading hours and giving more confidence . It is so comforting and reassuring to have a employee Dipanjali who will take the time and patience that did the proper trading calls ,correct entry and exit point.I will highly recommend her to anyone who needs assistance for trading guidelines and severe follow up. I have understood everything n thank you for doing it very well.. Hope to get good work from u..
Hello Sir,I have Read all information about your research companyI would really appreciate it I agree all terms and condition with us. Hi Team, I am happy with service being provided, Priyanka and Ajay are very cooperative and providing good support. Thanku for converting my plan in BTST cash and providing support by your executive "Nishta" to solve this issue that I was facing since last 10 days. I have taken ur BTST plan but I don't have any contact no of your executive or manager for any query related to trade in BTST. So please provide me contact no of your concern person. I Chandan Das, I m satisfied the service of epic research's trading call. My executive Mr. Vinay everyday call me. M very happy to give your service. Thank you..
Sir, Reference to the telephonic conversation, I would appreciate your help and support and encouragement that has been extended to a new comer like me in the stock market. Thanks a lot to your support team. Thanks a lot to EPIC research. good service. hope in future the same. This support request has been marked as completed. We would really appreciate it if you would just take a moment to let us know about the quality of your experience. Dear Omkar and Parminder I am so great full to having a supporter of Omkar and Parminder. I really appreciate your Effort and I like the paten of your work. Both of you are so dedicated and supporty. I am very happy to work epic research. Dear sir I would like to inform you that epic research service is very good & I am Also appreciated to Binay dew for good copration. Dear Team I have been a old customer of EPIC EPIC has provided really good services Specially Neeta in customer service has been really helpful and always advised good I expect EPIC to continue giving similar service. Miss Shubhangi medam thank so much for taking action at your end for my complaint Excellent with warm regards. I am happy with your service and satisfied with your calls. Your executive Vinay is always in touch with me and help me to earn profit as much as possible.